Yes, I know I have the wrong holiday! 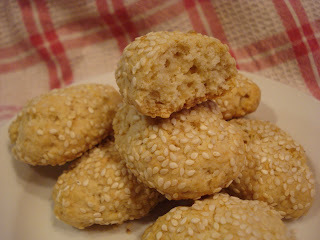 These Italian Sesame Cookies are also known as Biscotti Di Regina and are usually served at Christmas time. But I wanted another quick and easy cookie recipe and I also wanted to use some of the sesame seeds I had and not yet used so...this is it. I watched the video of this recipe being made and decided it looked like a good choice. The way in which it's put together is a bit unusual, placing the dry in the mixing bowl first, then adding the butter and vanilla. Seemed a bit backwards, but it did come out fine. Had I not watched the video, I would have had my doubts! I made the first batch of cookies the way it was shown in the video but then I decided to make another batch forming the cookies in more of a log shape, which to me are more typical of this type of cookie. I also found I had to bake them longer than the recipe said, although this may have just been my oven. ( But I'm convinced I'll always have oven issues!). I took the first batch out too soon and they were a little too soft inside so let them get a nice golden brown on the bottom. One last thing, I think they could have used a little more flavor so next time I'd put some almond extract in there, although a little more vanilla may have helped. ( There already is quite a bit of vanilla for this small batch). Add the dry ingredients to your mixer bowl and mix just to blend it all together. Add the vanilla and butter on low speed and mix til nicely combined. The mixture will seem crumbly at this point. Add the milk and then it will all come together and form a nice dough. Scoop small pieces of dough and form into balls. Then roll between your palms to form a log shape. ( The photo below is the first batch I made, in case you're wondering why it's still a ball shape!). 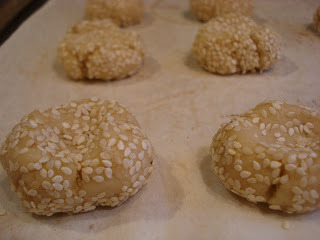 Roll in the sesame seeds and place on parchment lined baking sheets. Still showing the first batch, (below). 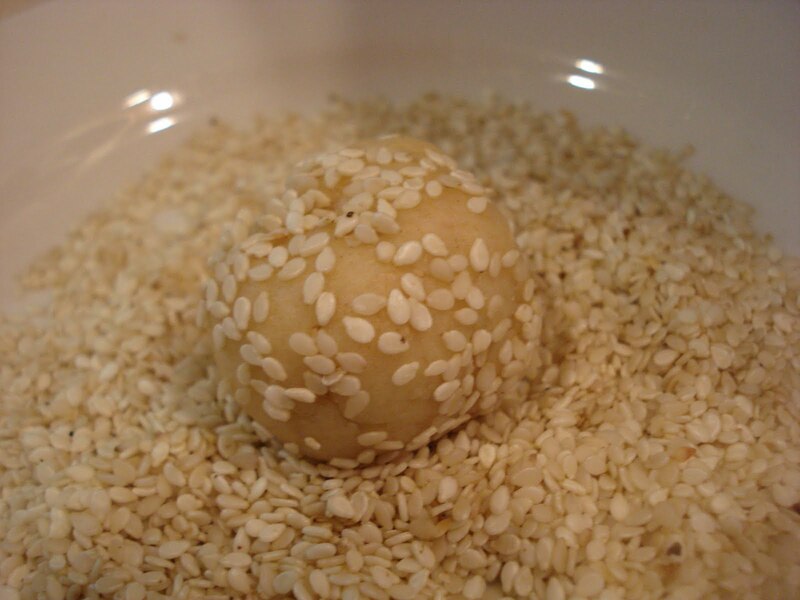 The original recipe says to shape into a ball, then coat with seeds, then flatten the center with your finger, but I didn't like this shape, once baked. Bake at 350 for 18 to 20 minutes. Makes about 18 cookies ( depending on the size you make). 6 tbsp. unsalted butter, softened, cut into pieces. 1. 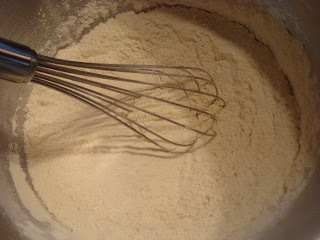 Add flour, sugar, baking powder and salt to mixing bowl and mix to blend. 2. Add vanilla and butter and mix on low til it's all nicely incorporated. 3. 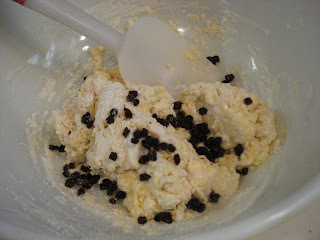 Add milk and turn speed to medium and mix til dough comed together. 4. Scoop small balls of dough about 1 1/4" and roll between your palms, then form into a log shape ( if you want this shape.) You could also leave them in the ball shape, too. 5. Roll in sesame seeds and place on baking sheet leaving a few inches apart. They don't increase in size too much. 6. Bake for 18 to 20 minutes, or til golden brown on bottom and a light golden on edges. 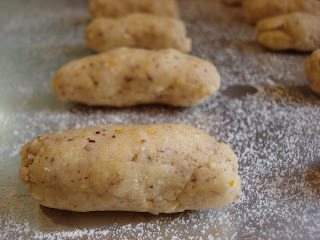 I was looking for a quick and easy cookie recipe today and I found this one, originally called Hazelnut Orange Fingers. It's from the December 2008 issue of County Home Magazine. They featured their winning cookie recipes from the magazine's first Holiday Cookie Contest. The cookie most closely resembles a Mexican Wedding Cookie, with the ground nuts and a simple butter, sugar, flour dough, except that instead of rolling it in confectioners sugar after it's baked, you dip it in chocolate. I just love the combo of orange and chocolate together and the addition of orange zest in the cookie dough with the chocolate really gives it a wonderful flavor. I can see why it was among the winning recipes! And it is really quick and easy to make. I thought I'd dip it in semisweet chocolate and white chocolate, just to mix it up a bit. Both chocolates tasted great and my son, Kris had no trouble polishing off quite a few! I could also see these made into different shapes, such as a typical round or how about a crescent? 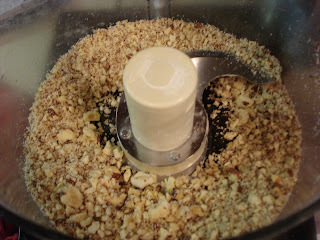 Begin by toasting the hazelnuts, then pulsing them in the food processor til they're finely ground. 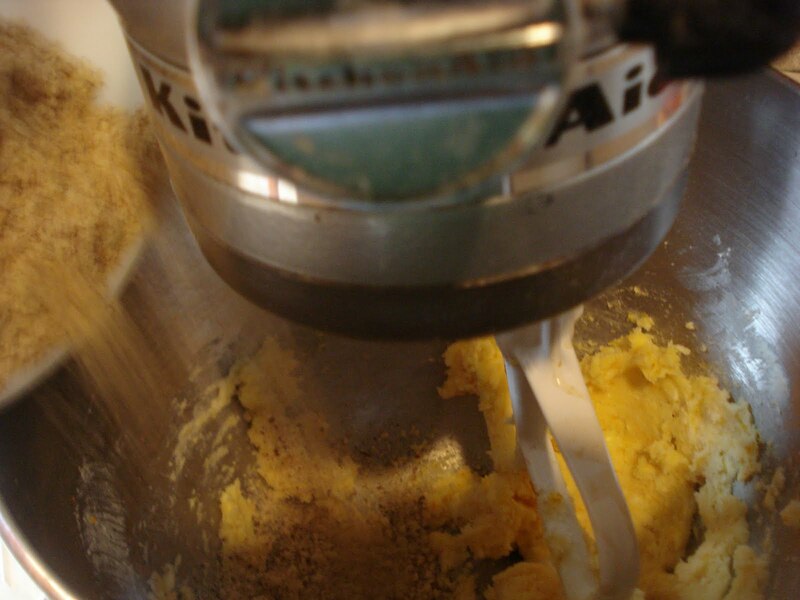 In your mixer, beat the butter, then add the sugar, vanilla and orange zest and beat on high til light and fluffy. Beat in ground hazelnuts til combined. Then beat in the flour. Roll 1 tablespoon portions of dough into 2 1/2" finger shapes. 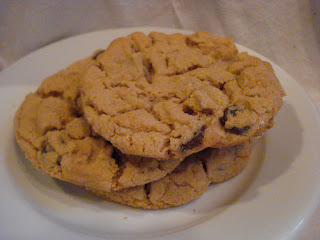 Place cookies on ungreased cookie sheet 2" apart and bake in a 350 oven for 12 to 14 minutes. Let them cool, then dip or just coat the tops ( which is what I did) with the melted chocolate. Then drizzle with the milk chocolate ( or white chocolate). 1. Toast hazelnuts: Place hazelnuts in a baking pan and bake for about 13 minutes or til fragrant. While still warm, rub briskly in a clean kitchen towel to remove most of the skins from the nuts. 2. Place nuts in a food processor and pulse til finely ground. Set aside. 3. 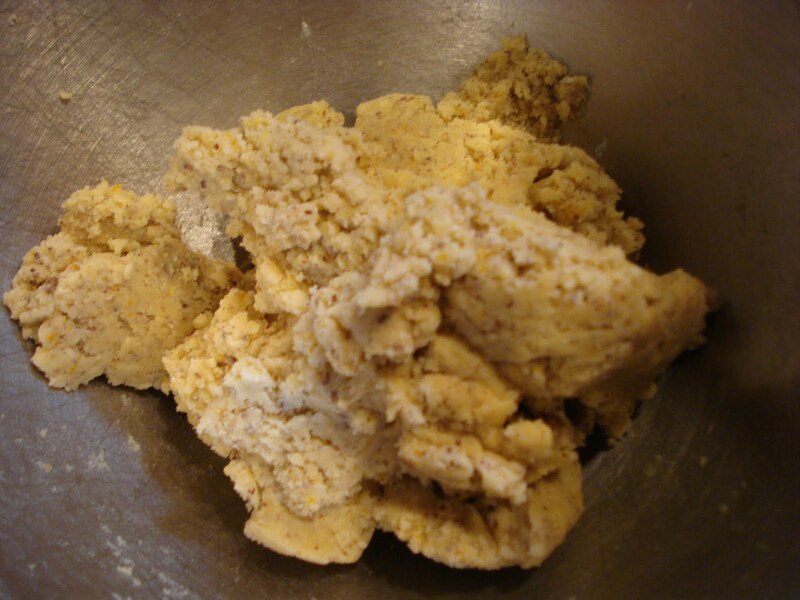 In a large mixer bowl, beat butter on high for 30 seconds. 4. Add sugar, vanilla and orange zest and beat til light and fluffy. 5. Beat in the hazelnuts til combined. 6. Add in the flour, mixing just til combined. 7. 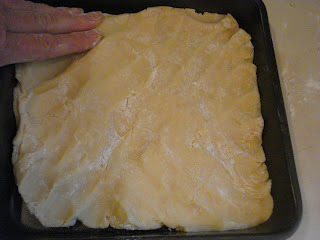 Roll 1 tablespoon portions of dough into 2 1/2" fingers. 8. Place on ungreased cookie sheet, 2" apart and bake for 12 to 14 minutes or til edges begin to brown. 9. Remove from oven and cool a few minutes on sheet. Transfer to wire racks to cool completely. 10. Using a double boiler, melt the semisweet chocolate with the shortening over low heat. 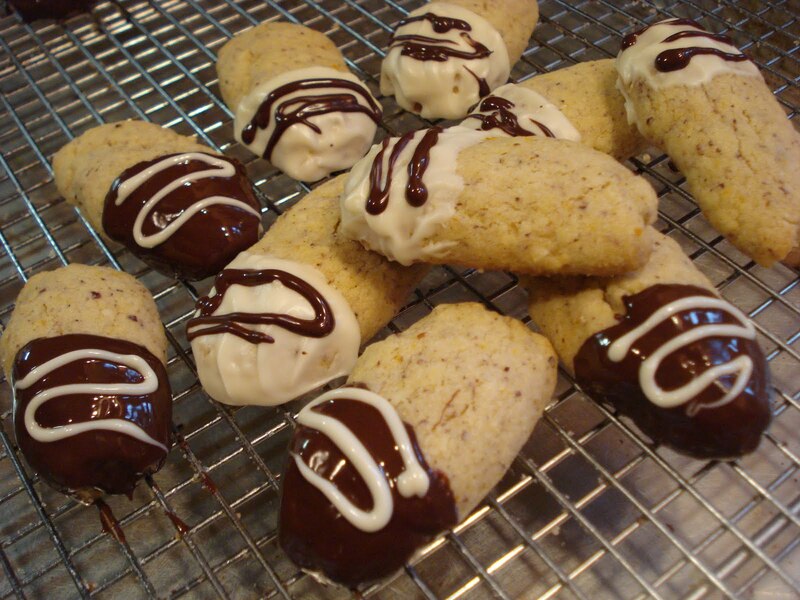 Dip half of each cookie in chocolate, allowing excess to drip off. Place on waxed paper til chocolate is set. 11. Using double boiler again, melt milk chocolate with shortening and drizzle over cookies. * Store undipped cookies, layered between sheets of waxed paper, in an airtight container at room temp. for up to 3 days, or freeze for up to 3 months. Thaw before dipping in chocolate and drizzling. Every time I search for a family recipe, or any other kind of recipe for that matter, I go through an old familiar box I have filled with a pile of papers. The pile which includes recipes written on the back of envelopes or old note paper in your mom or mother in law's hand for a certain cake or cookie. That box which you've taken with you with every move. That box you'd never part with or ever bother to update because once you find the recipe you're looking for, the box gets put away til the next time you need it. You probably know what I mean because, if you're anything like me, you've been collecting recipes from here and there for years..right? How many years? Well, I guess that depends on a few things. Like, how old you are and when you first became interested in cooking or baking. For me, it's been practically my whole life..which is a really long time! 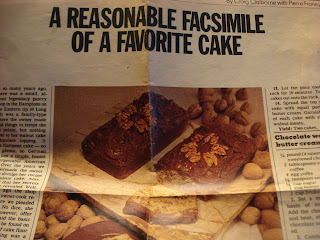 Among the pile of old, torn and often stained recipes, I have flipped past this particular recipe for Walnut Cake with Chocolate Butter Cream that I tore out of The New York Times Magazine from April of 1980! Yikes..you do the math! That's a long time. So, this morning I finally decided to make this Walnut Cake. I'm not exactly sure why I chose this particular morning, 30 years later, to make it, but I did. I didn't have time to make the Butter Cream to frost it, but next time, and there will definitely be a next time, I will be making the Butter Cream Frosting. The recipe was written by Craig Claiborne with Pierre Franey. They write that there was a small almost legendary pastry shop in the Hamptons in Long Island. They go on to write that the owner made wonderful things but nothing was equal to her walnut cake. It was a simple, honest and unforgettable American creation. Well, the shop eventually closed and the owner retired but she would still not give out the recipe for this cake. But she did give one clue, which was that the basic cake recipe could be found on the back of a box of cake flour and the frosting was a simple chocolate butter cream. So they experimented til they came up with this "reasonable facsimile"! 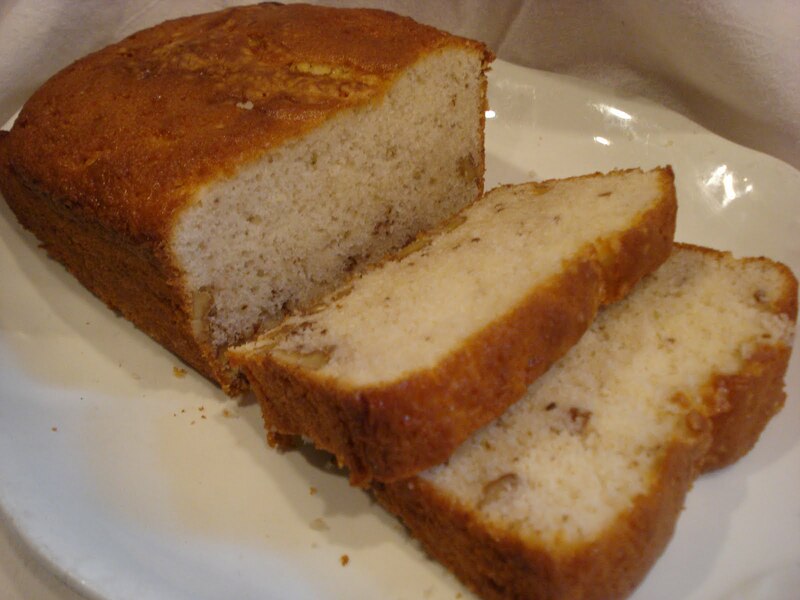 The result is a light, moist loaf cake with a hint of almond ( from a little almond extract) and the wonderful crunch from the chopped walnuts. It is truly a delicious cake that I think deserves to be made into a layer cake with this Chocolate Walnut Butter Cream Frosting. 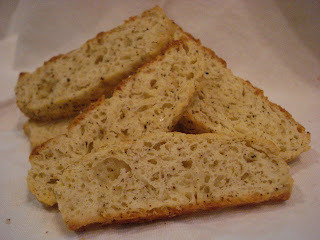 The recipe makes 2 loaves but, as usual, I halved the recipe, which was very easy to do to make one loaf. 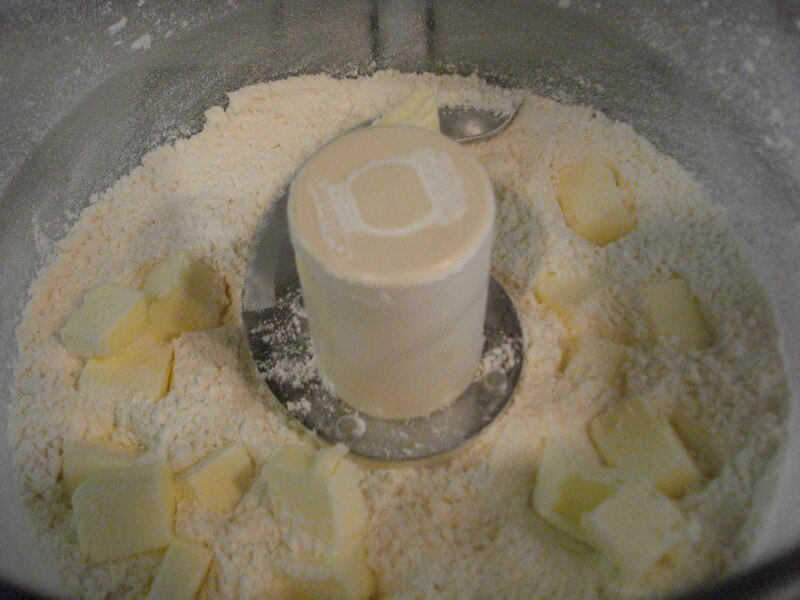 Begin by beating the butter, adding the sugar gradually. Beat this for 10 minutes. Set your timer and just let it go. Continue on to the next step. Sift the flour, then remeasure the amount. ( You'll be surprised that you have so much extra flour. Halving the recipe, I had almost 1/3 cup too much after sifting!). Then add the baking powder and salt. 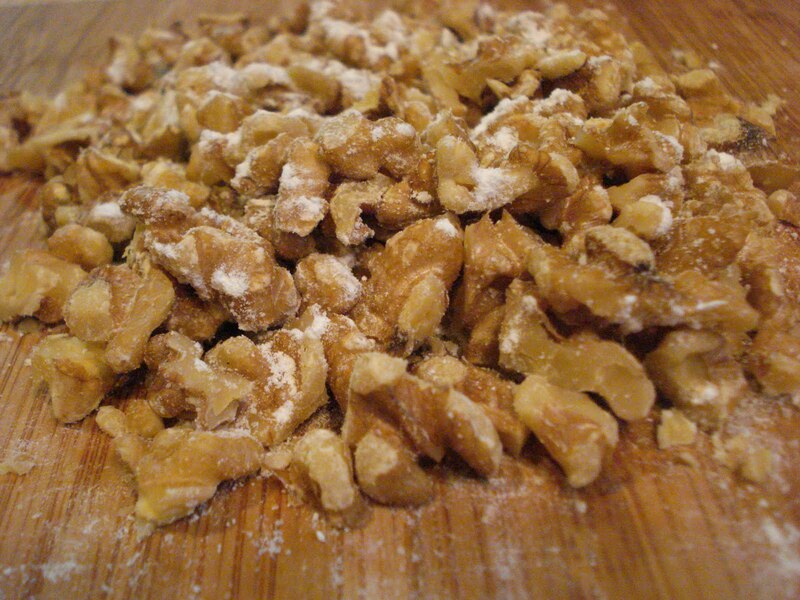 Toss the broken walnuts with one tablespoon of flour. Once the butter/sugar mixture has been beaten for 10 minutes, it will be nice and light. 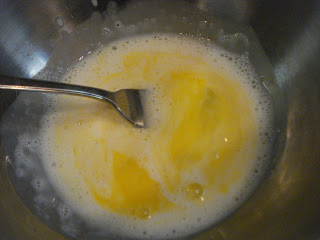 Add the eggs, one at a time to the creamed mixture. Combine the milk and both extracts. 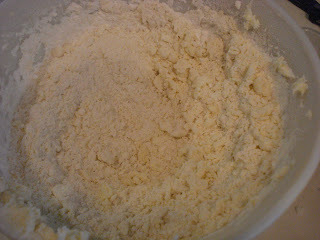 Add the flour mixture and milk mixture alternately to the creamed butter mixture. 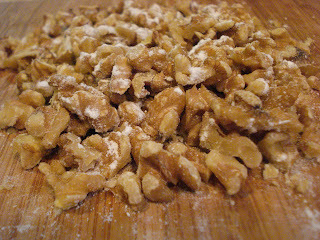 Add the floured walnuts and beat on low speed til blended. Butter your loaf pan and spoon the cake batter into the pan. Bake 50 minutes at 350 or til a knife inserted into the center comes out clean. Let the cake cool 10 minutes in pan then turn out onto a wire rack to cool completely. Frost with the chocolate walnut butter cream. Decorate with walnut halves. 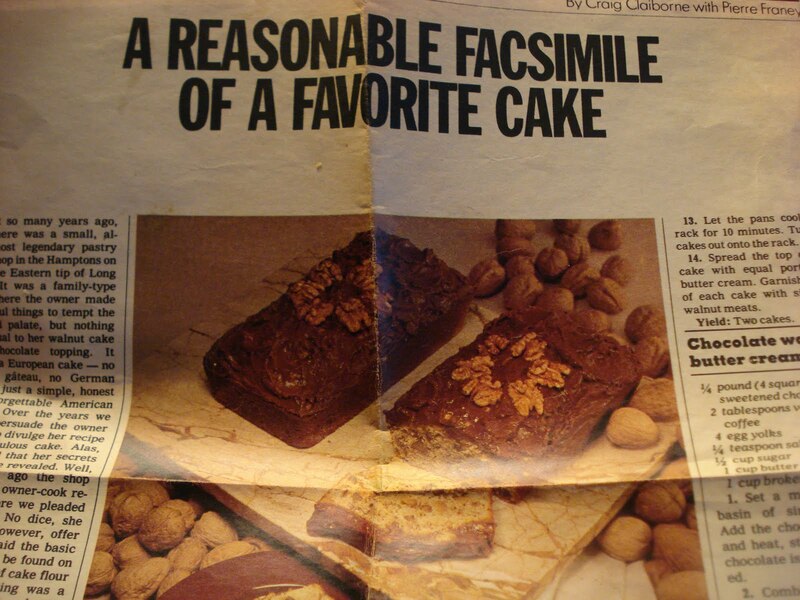 Walnut Cake with Chocolate Walnut Butter Cream (from The New York Times Magazine April 1980 written by Craig Claiborne with Pierre Franey). Preheat oven to 350. Butter 2 loaf pans measuring 9" x 5" x 3". 1. 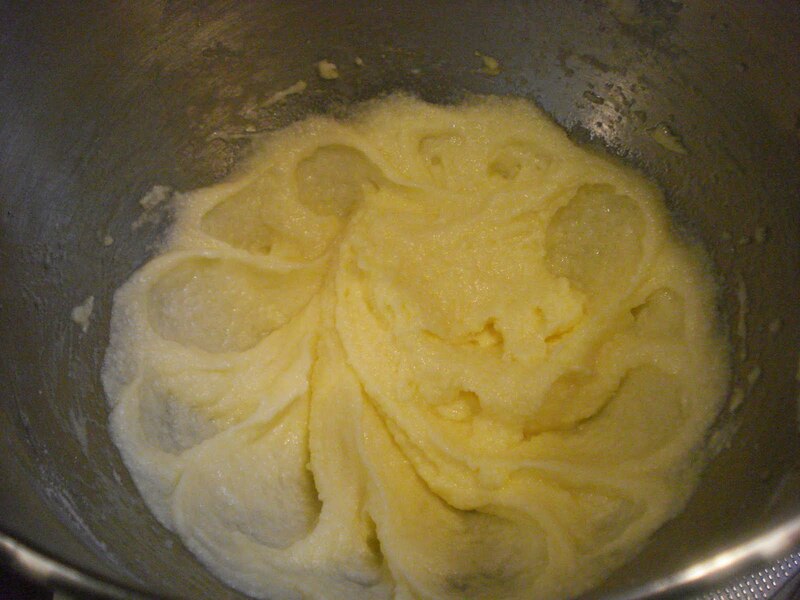 Cut the butter into small pieces and add to bowl of mixer. 2. Gradually add the sugar and beat on medium speed for 10 minutes. 3. 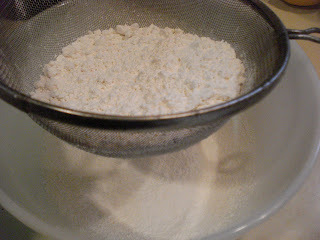 Sift flour and remeasure. Then sift with the baking powder and salt. 4. Toss the broken ( or chopped) walnut meats with the tablespoon of flour. Set aside. 5. 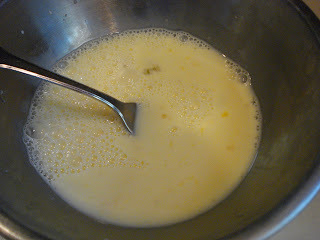 Add eggs, one at a time to the creamed mixture, beating well after each addition. 6. Combine the milk with the vanilla and almond extracts. 7. 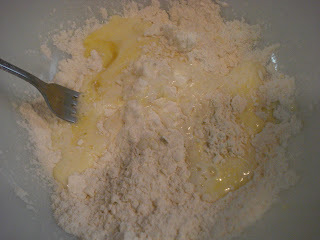 Alternately, add the flour mixture and the milk mixture to the creamed mixture. Beat well after each addition. 8. Add the floured walnut meats and continue beating on low speed til well blended. 9. Spoon the batter into the prepared pan. 10. 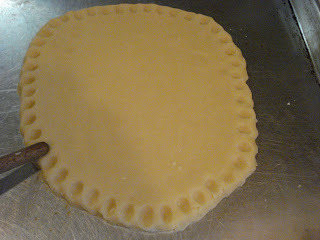 Bake 50 minutes or til a knife inserted into the center comes out clean. 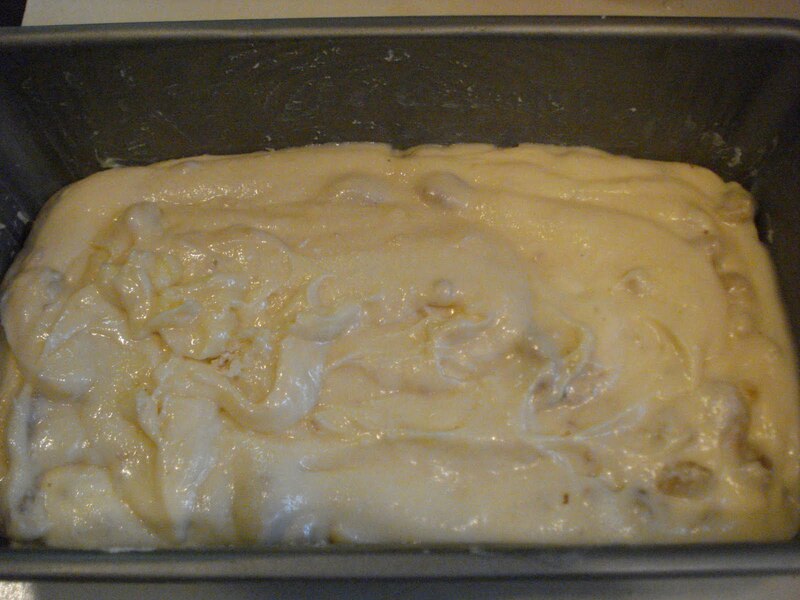 Cool in pan 10 minutes, then turn the cake out onto a wire rack to cool completely. 1. Set a mixing bowl over simmering water and add chocolate and coffee and heat, stirring often, til chocolate is melted and blended. 2. Combine the yolks, salt and sugar in another bowl. Set the bowl over simmering water and beat the yolk mixture rapidly with a whisk or hand held mixer. Beat til the mixture forms a "ribbon" . That is to say, til it is thickened and falls into a "ribbon" when the beater is held up. 3. Spoon and scrape the chocolate into the yolk mixture. 4. Return the bowl onto the simmering water and continue beating. 5. Gradually beat in the butter, bit by bit. 6. Remove the bowl from the heat. 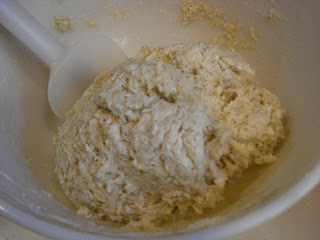 Continue beating in a cool place til the mixture thickens slightly and becomes spreadable. 7. Beat in the walnuts. 8. Continue beating with a wooden spoon til the chocolate cream becomes somewhat lighter. Let cool til spreadable. Spread over the cakes. I decided it was time to put the new oven to the test. The baking is going along without any overheating issues so today was the day to give it the official scone test, since the higher oven temperature was the problem with the other ovens. I thought it might also be a good opportunity to try a little different scone recipe so I searched for a recipe that used buttermilk, which is what I had in the fridge, rather than half and half or cream. I found this one but changed one of the add in ingredients. I changed the dried cranberries to currants but kept the lemon zest. I have to say that the scones turned out way better than expected. 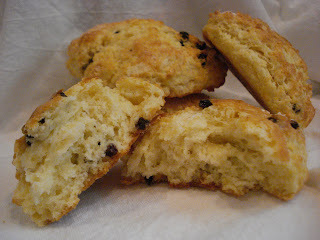 They were light, very much like a biscuit, and the lemon zest really came through, giving them a wonderful flavor. And.. how about with a dollop of this? Yum! I forgot to brush some cream on top before baking, which I always do with my scones. I usually add a sprinkling of raw sugar on top,too..which I also forgot to do! As usual, I halved the recipe and I could have gotten more than just 4 scones out of this but I cut them rather large. 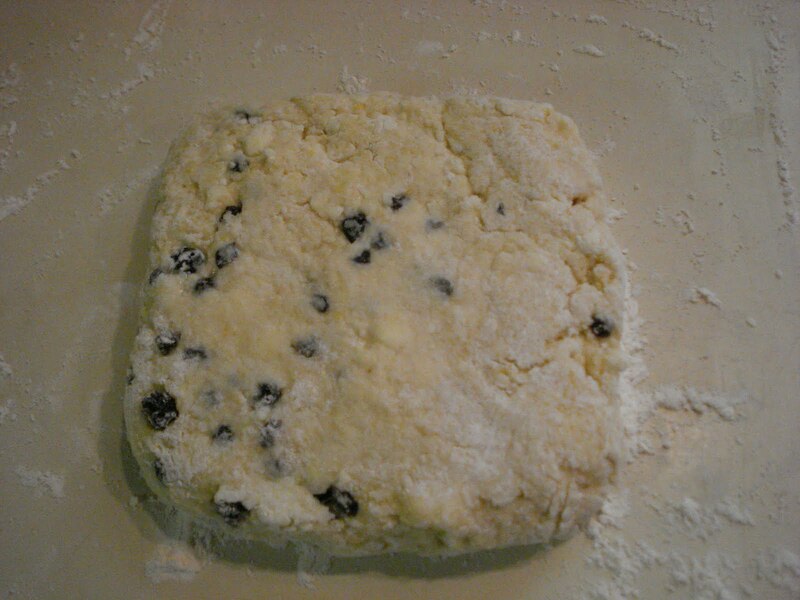 I didn't want to waste the dough so I formed it into a square, rather than a circle. 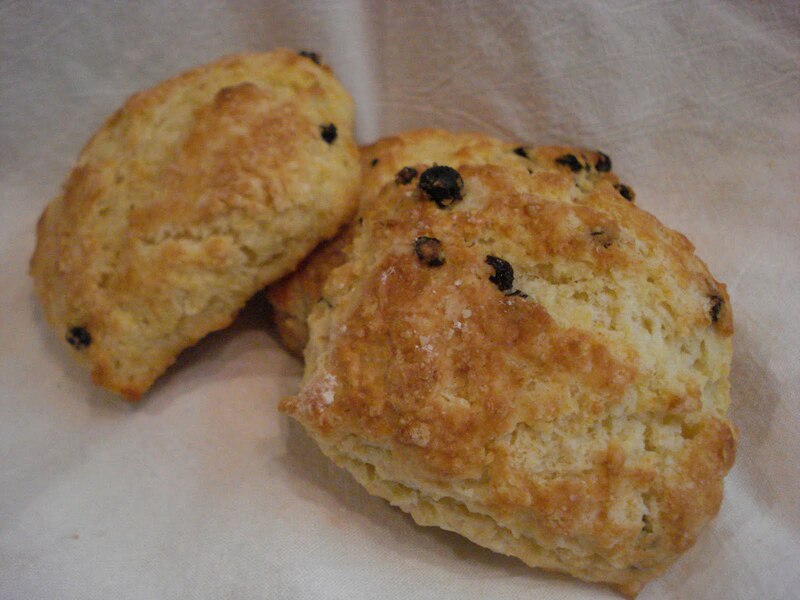 One last thing, I made the scones the way I usually do so the original recipe is a little different. Throw the dry into a food processor. Add the cold butter pieces and give it a few pulses til the butter is in smaller chunks. 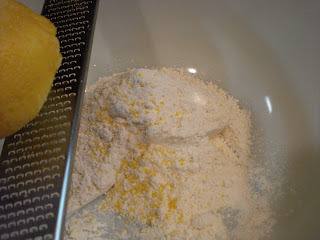 Then dump the mixture into a large mixing bowl and grate the lemon zest into the dry/butter mix. Mix it a bit with your fingers to break up any remaining large lumps of butter. In a small bowl, beat the egg and buttermilk. And add to the dry mixture stirring gently with a fork. Switch to a spatula and stir just a few times to combine. Throw a handful of currants into the mixture and gently fold them in. 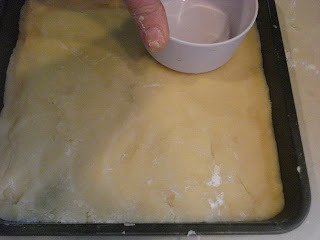 Dump the dough onto a floured work surface and form into a circle or square, using floured hands. Cut the dough into which ever shapes you prefer. 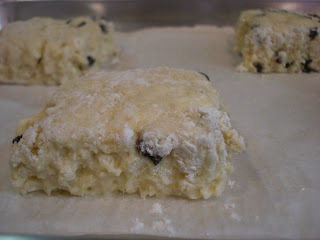 Scoop up and place onto the parchment lined baking sheet. Place about 3" apart. And remember...brush the tops with cream or milk and sprinkle with coarse or raw sugar. Then bake! 1. Place flour, sugar, baking powder, baking soda, salt and butter pieces into food processor and pulse a few times til butter is in smaller pieces. Place mixture into a large mixing bowl. 2. In a small bowl, beat egg and buttermilk. 3. Add the wet to the dry and mixing with a fork. Switch to a spatula and gently stir a few times. 4. Throw a handful of currants into the mixture and gently fold them in. 5. 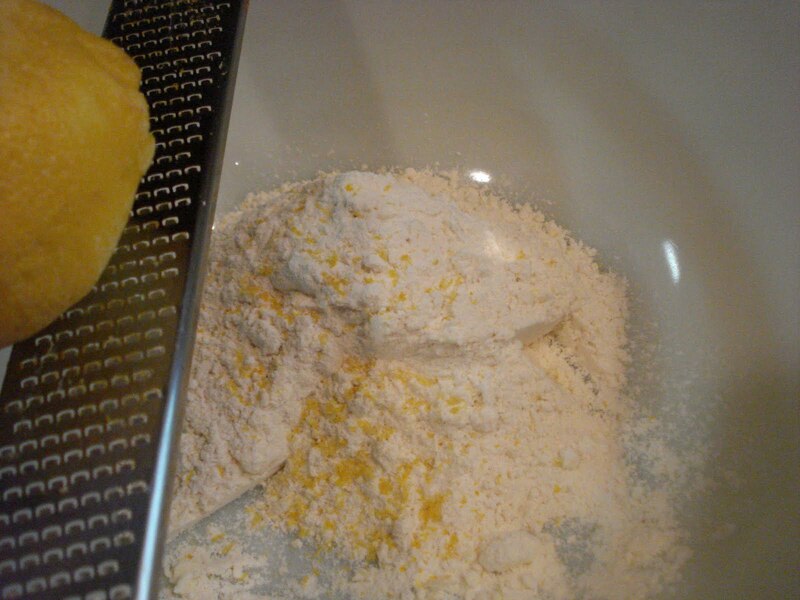 Dump the mixture onto a floured work surface and form into a circle or square about 1 " thick. 6. 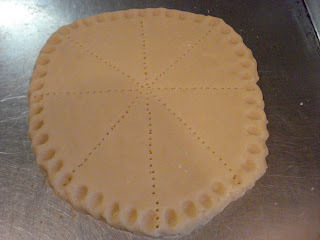 Cut out shapes you prefer and place them onto a parchment lined baking sheet about 3" apart. 7. Brush tops with cream or milk and sprinkle with coarse or raw sugar. 8. Bake 12 to 15 minutes. They should be slightly firm to the touch and light golden brown. 9. Cool on wire rack. Best eaten warm with a cup of tea...just out of the oven! We had such beautiful weather this weekend and I knew it that would bring a good crowd into the farmers market! I didn't have the patience to babysit baking my scones. So I needed some new goodies to sell but..well, let me explain. A while back my old reliable oven I've been baking with for the 9 plus years I've been in this house decided it was tired and just freaked out on me one day. So I went out, picked out a new one, had it installed..but it didn't work correctly. The temperature kept increasing, once I set it over 350, to the point that it was burning the bottom of what I was baking, especially my scones. I found the only way to bake the scones properly, without them burning was to actually keep an eye on the oven as they baked to be sure the temp. didn't go to 475! Which it did and I had to open the damn oven door to lower the temp.!! Who wants to bake this way? Not me! So I had them take away that one..bring in a new one..and that one didn't work correctly either! It did the same thing! So now I'm on my third oven, different make and so we'll see what happens! And this one bakes convection also. Should be interesting getting adjusted to it. So, that is why I chose to try these famous brownies by the bakery "Baked" in NYC. The recipe is very well known and they've gotten such great reviews that I thought it was time to give them a try. If you read the recipe, you'll notice a few notes that go along with it. One in particular that states to be sure to not to overbake them. Well, I was so afraid I would maybe do just that , that I think I may have taken them out a minute too soon. It did pass the toothpick test, though. They were dense and fudgy and although everyone who tried a sample seemed to really like them, I 'm really not convinced they live up to all the hype!! Sorry.. just my humble opinion. The peanut butter chocolate chip cookies I've made a few times before. They're from Smitten Kitchen's blog ( and originally from the Magnolia Bakery Cookbook) and they're really great! Unlike other peanut butter cookie recipes I've tried, these cookies don't crumble into a bunch of crumbs. They hold their shape and taste amazing! I hope you'll forgive me for not posting the recipes. I have , however, provided the links. I'd love to hear from you on either or both recipes. Have you made them? 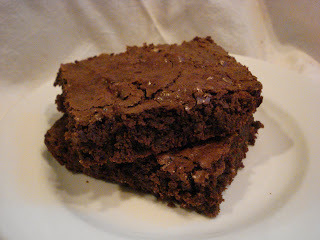 What do you think of the brownies? And, BTW, I did use Valhrona cocoa powder! I didn't skimp on the ingredients! (Just thought you might be wondering!). When I was in Florida a few weeks ago, we went shopping at a very upscale Italian grocery called Carmine's in West Palm Beach. This store was packed to the gills with all things Italian! And, you'd think they were giving the stuff away it was so crowded with shoppers. But..hardly giving it away..as I said, it's an upscale market and the prices were crazy! 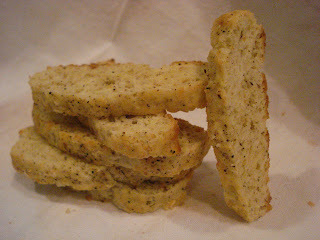 One of the products I bought was a box of savory biscotti that was supposed to have in it sun dried tomato and some other herb. I think basil..or something. On the cover of the box , there was a picture showing what looked like a really nice crunchy biscotti but when I opened the box, it was a huge disappointment! It actually looked nothing like the picture, kind of like dog biscuits! (Sorry, I know that's pretty gross..but it did!) And it tasted awful. Well, since I've been wanting to make a savory biscotti I did a little research and found this recipe from Gourmet Magazine. It sounded really good, with a good quality parmesan cheese and black pepper. 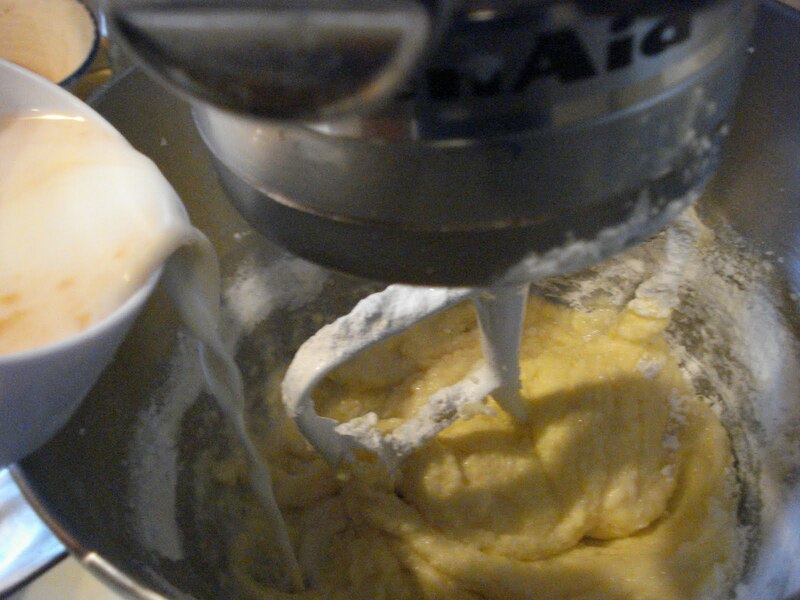 The recipe is easy to make, although you have to do a little work by hand, rather than using your mixer. But if you do what I did, it will come together quickly. And once again, I halved the recipe! Begin by pulsing your whole peppercorns in a grinder. Ok..I don't own a grinder so I just used regular ground black pepper. See, I already saved you a step! Then whisk together your dry ingredients and pepper and cheese in a large bowl. You're supposed to blend in the cold butter with your fingertips. I grated the butter into the dry and this worked great. Then blend with your fingers to combine. And add it to the dry/butter mixture. Stir to combine. 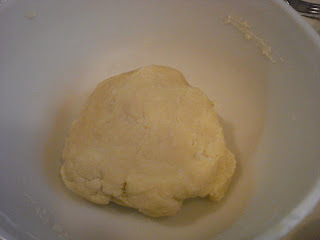 It will form into a dough ball. Then divide it into 4 pieces and shape into logs. Place the logs on your baking sheet ( or sheets). I used parchment paper. Form the logs using you hands slightly dampened. 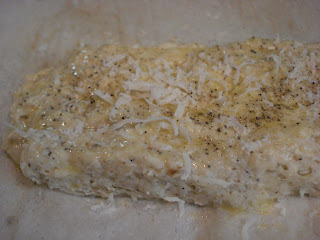 Brush tops with beaten egg, then sprinkle with more grated parmesan cheese and black pepper. Bake for approx. 30 minutes. Let cool 15 to 20 minutes, cut into slices and lower oven temp. to 300. Bake slices again about 10 minutes on each side. The texture is light and they have a wonderful crunch..it's all about the crunch with me! The flavor of the cheese and pepper really comes through to make it a great appetizer cracker with wine, cheese, dip..or just by itself. Preheat oven to 350. Line baking sheet(s) with parchment paper. 1. Pulse peppercorns in a grinder til coarsely ground ( I don't own a grinder so I couldn't do this step but you could certainly use your peppermill). 2. 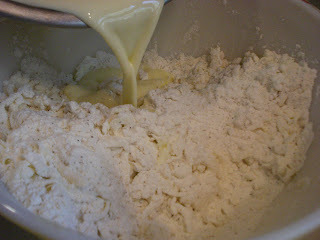 In a large bowl, whisk flour, baking powder, salt, 2 cups of cheese and 1 tbsp. ground black pepper. 4. Whisk 3 eggs with the milk and add to flour/butter mixture. Stir with a fork til soft dough forms. 5. Divide dough into 4 pieces and place each piece onto baking sheet(s), forming into logs approx. 12" x 2" x 3/4" high. They will spread so place them about 3" apart. 6. Brush tops with remaining egg and sprinkle remaining cheese and pepper on top. 8. Let the biscotti cool about 15 or 20 minutes. 9. Using a serrated knife, cut slices. 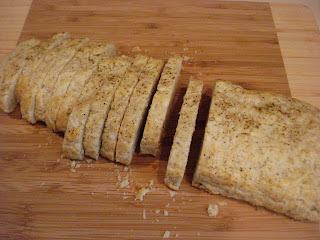 I like mine a little thinner than the sweet biscotti so I cut mine 3/8" thick but the original recipe says to slice 1/2" thick. 10. Lower the oven temp. to 300. Place the slices back on the baking sheet and bake each side 10 minutes. I would keep them in a tin or some other air tight container. 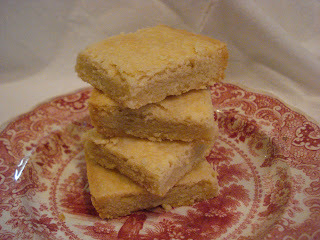 I decided to try a second, an actually a third recipe for Scottish Shortbread today. I figured, this way I can try all 3 to know which I like best. The recipe I'm showing you here is the third and I chose to include it because I just quite frankly liked it alot! It turned out to be my favorite of the 3. My son , Kris, chose the second one..but..hey..my blog..my choice! No, really, the second was very good, too, but what I like about this recipe is the texture. It isn't so crumbly and it has a little more crunch than the other 2. 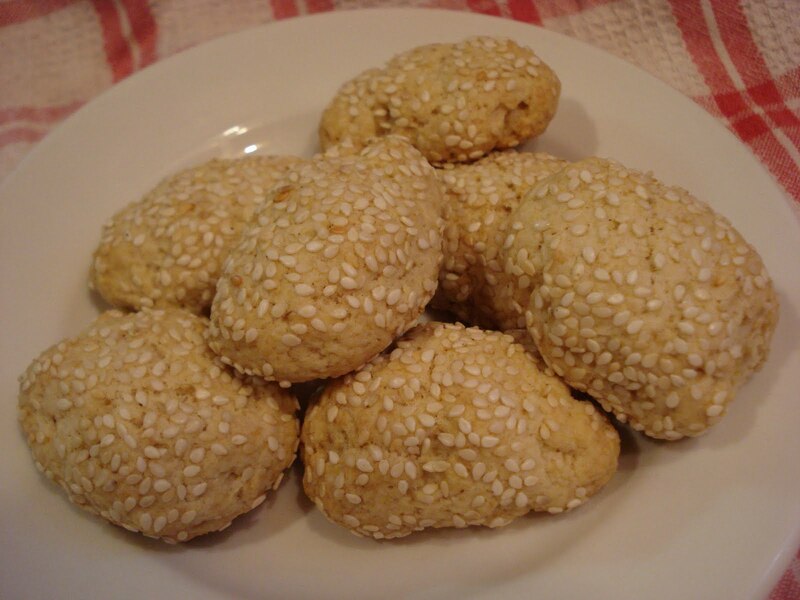 And by the way, now that a day has passed, I tasted the first recipe again and I think it has a bit of a floury taste, compared to today's recipe. 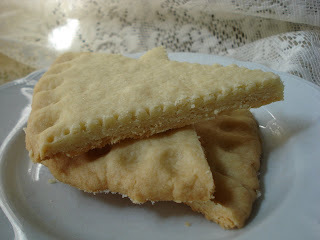 What's different about this shortbread recipe today is that it uses white rice flour,which gives it a more tender texture. It looks very much like cornstarch. But since the recipe calls for regular granulated sugar, albeit superfine, it has just a bit more crunch than using confectioners sugar only. 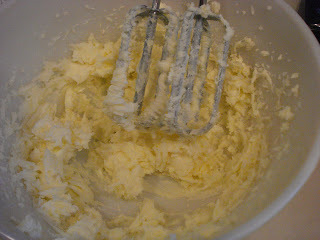 So to begin this recipe you combine the butter and sugar using a handheld mixer ( or a wooden spoon), and beat til light and creamy. Add the flour and white rice flour and beat to combine but don't beat too much more with the mixer. 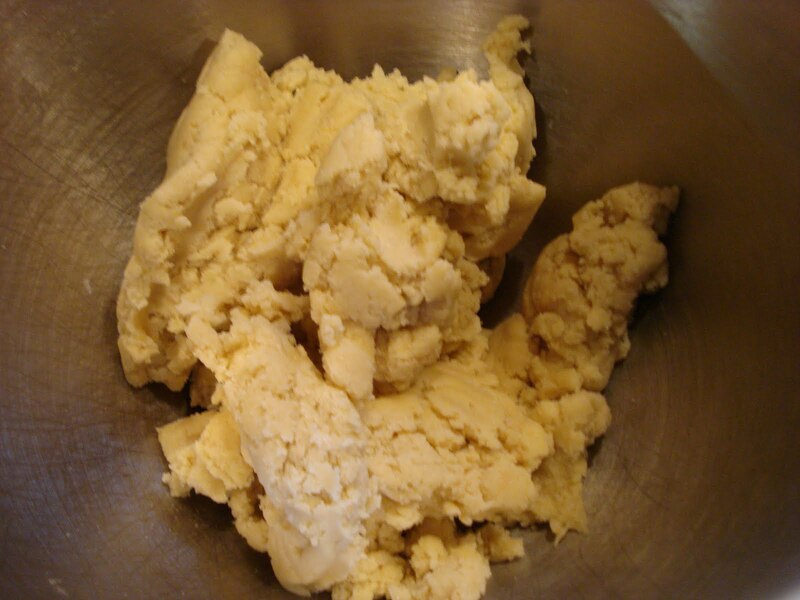 The dough should still look crumbly. 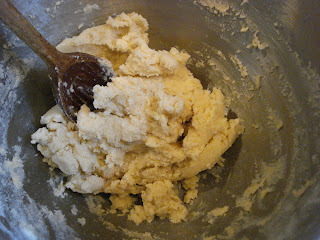 Loose the mixer and using your hands, mix it all together. The heat from your hands will help combine the dough into a nice ball. Don't overmix though! At this point, I turned it out onto a sheet of waxed paper and placed another sheet over top and rolled it from the center out, turning the circle as I rolled. Then you can place it onto your baking sheet ( I didn't grease it, with all that butter, that didn't seem a necessary step). Then take the end of your wooden spoon and make indents all around the edge..just to make a pretty pattern! Using a fork, prick the areas where you'll be cutting apart the sections. 2/3 cup unsalted butter - room temp. Sprinkle baking sheet with a little sugar. 1. Using a wooden spoon or hand mixer, combine butter and sugar til light and creamy. 2. Add flour and white rice flour and beat just a little more. Mixture should still be crumbly. 3. 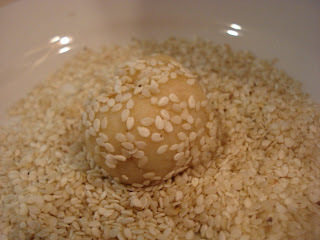 Using your hands, continue to combine the dough, forming into a ball. Don't overwork it. 4. Place the ball onto a sheet of waxed paper and cover with another sheet of waxed paper. Using a rolling pin, roll into a circle, rolling from the center out, turning the dough with each roll. 5. Place onto the baking sheet and using the end of a wooden spoon, make indents all around the edge. Then prick the sections that will be cut out into pieces with a fork. 6. Bake 35 to 40 minutes or til the edges are slightly golden but still a little soft in the center. 7. After a few minutes out of the oven, cut the sections using a sharp knife. 8. Let the shortbread cool completely on a wire rack. I like to keep it in a tin, rather than a rubbermaid type container. As I've stated on this blog before, I just love shortbread and making it is not only one of the easiest type cookie bars to make but the variations are endless! This is actually the first time I've made shortbread in a pan. 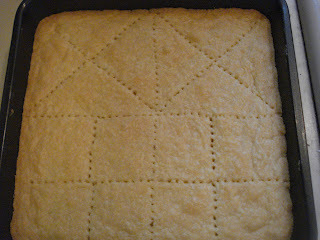 Up to this point, I made shortbread cookies, cutting out the shapes and using a variety of add-ins. With only basically 3 ingredients for this recipe, you have to use the best and freshest. I decided on this particular recipe from the many positive reviews it recieved, but I'm going to try a few others I found to compare..at a later date! The recipe goes together in no time. 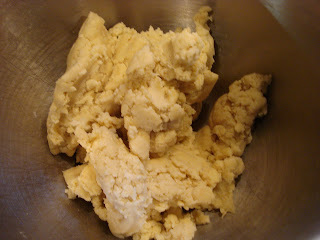 The end result is a buttery, crumbly, not too sweet shortbread that I just know will only improve in flavor with time. 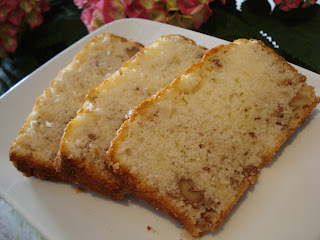 I took the advise of a few of the reviewers and added some vanilla, cut down on the flour, added a pinch of salt and used half confectioners sugar and half granulated sugar. I also halved the recipe, as I usually do this when I'm making a recipe for the first time..not wanting to waste precious ingredients if it doesn't turn out! Yeah, I'm cheap..err, I mean.. frugal! 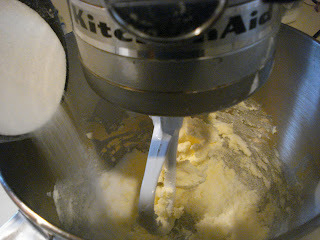 So begin by creaming the butter and sugar in a standing mixer. If you don't have one you'll have to do all this by hand with a wooden spoon, but think of the workout you'll get! Add in the vanilla during the creaming process. 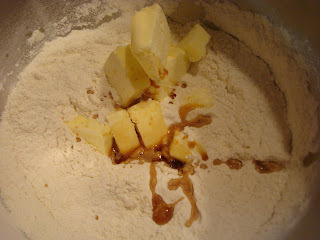 Once the butter and sugars are combined, add in the flour and salt. I combined mine just to the point of it still being crumbly and not totally mixed together. Then I switched to a wooden spoon and stirred the mixture til it looked more combined and in a nice buttery mass of dough. 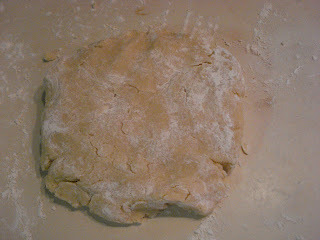 Turn it out onto a floured work surface and knead a few times, gently, to incorporate flour. Remember, it's not bread we're making here! Pat the dough into an ungreased pan. Then flatten out the surface using the bottom of a glass or cup or whatever you have that's flat on the bottom. Prick the shortbread, using a fork, wherever you are going to cut apart the pieces. I decided to experiment with the shapes, making some in triangles and some in squares. 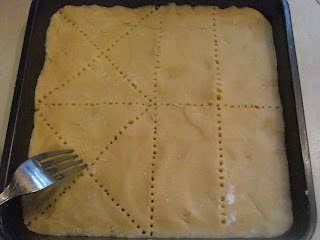 ( part of the way through the baking I added more fork pricks to change the rectangles into squares! And here's the shortbread just out of the oven. Let it cool in the pan about 5 minutes, then, using a bench scraper, cut the pieces along the lines and continue to let it cool completely in the pan on a wire rack. Then carefully lift out your first piece. The remaining pieces will be easier to get out. 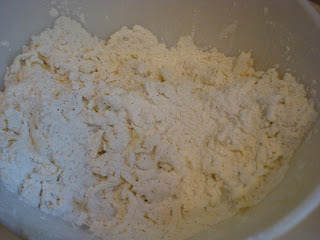 More flour-approx.1/4 cup for flouring work surface. 2. 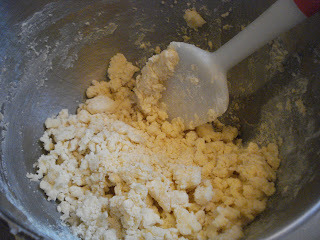 Add flour and salt slowly and mix til just combined and still crumbly ( or using your wooden spoon). 3. Stir with wooden spoon til a nice, buttery mass of dough. 4. Turn out onto a floured work surface ( using some or all remaining 1/4 cup of flour). 5. Place into a 10" x 15"pan. ( Since I halved the recipe I used a 9" square pan). 6. 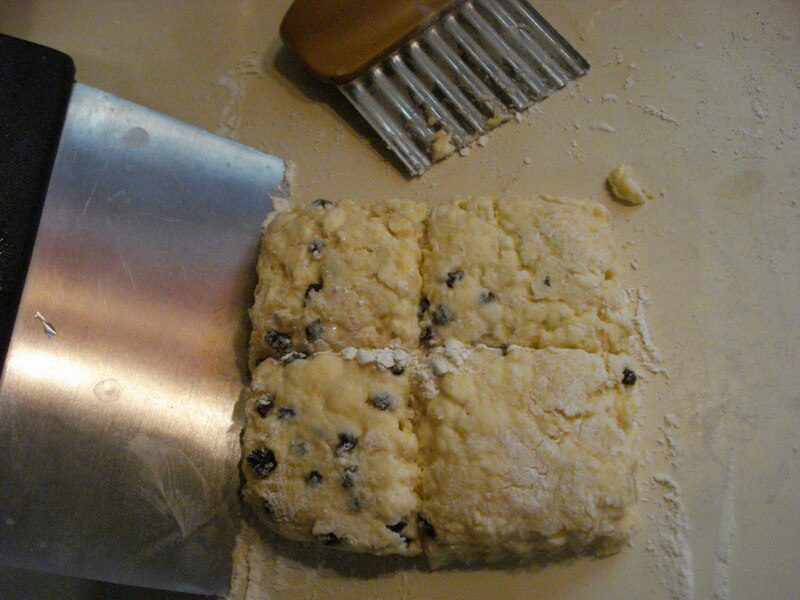 Using a fork, prick the shortbread wherever you'll be cutting the pieces. Go all the way through with the fork to the bottom of the pan. 8. Lower the heat to 300 and continue to bake another 25 - 30 minutes. (Mine took 25 minutes.) The edges will be just turning a light golden brown. 9. Take out of the oven and let it sit in the pan 5 minutes. Then cut into your pieces using a bench scraper or sharp knife. 10. Continue to let it cool completely in pan on a wire rack. I'm storing mine in a tin, which I think is best for shortbread.